Running Safety. It's something that most of us need to think more about. I remember a time long ago when I was probably 15 and training for my first marathon. I had a 4 mile run that I needed to pound out before school and so I woke up at 6 am. It was still a little dark but the sun would be up before I got home. My run consisted of a loop that went around a family neighbor hood, over to the high school track and back. There was one part of my course though that edged by the park. Well on this particular morning I had decided to put a Lord of the Rings soundtrack in my walkman (I told you this was a long time ago) to listen to as I ran. As I was running by the park area the Black Riders theme song conveniently started to play. Slowly, a little blurry, at first, then more clearly I could see the Riders coming out of the park ferociously trying to catch me. Faster and faster they came. Ok, my imagination was going a little bit wild but I was only 15 and it was dark and you know what they say about the female imagination. Lets just finish this story by saying that up to that point I had never booked a 4 miler that fast. By the time I made it home I was supremely happy for two reasons: 1. I had outrun the Black Riders and made it home safely and 2. I had set an unofficial PR for my 4 miler. The moral of the story is a little far fetched but bear with me. Run Safely! Use common sense when you run! Be prepared to deal with unpleasant circumstances! And it is ALWAYS better to be safe than to be sorry. There are so many sad cases of runners becoming dehydrated, suffering heat stroke, getting mugged, robbed and worse because they didn't have a game plan, course of action, or just weren't aware of their surroundings. Did think of running safety. We live in a real world. Bad things happen whether we like them or not. We hope that nothing will ever happen to us or our loved ones while out on a run but you have to think of it. That is the first step towards preventing the unfortunate. 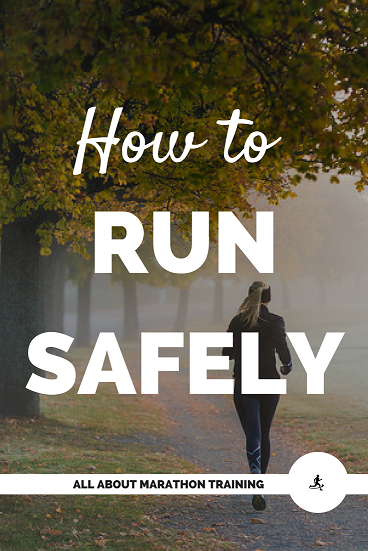 So here are some Running Safety Tips that any runner, especially female runner should remember to employ. Let someone know when, where and how long it should take you to run. Even if traveling alone it is always a good idea to leave a note at where you are staying just in case. Never have just one running route. Mix it up. Go different ways, directions on different days. Don't run in poorly lit areas. Don't run in unfamiliar neighborhoods at night. Always appear confident. Look straight in front of you. Looking down at the ground gives the appearance of weakness. Be conscious of your surroundings. Stay alert. Keep the volume of your headphones low so that you can still hear. Better yet skip the earphones, especially at night as it is a sign of distraction. Ignore offensive comments and don't give a reaction. Just keep running. Some people may disagree but briefly look at a person/car who passes you. This shows that you have seen them and they are less likely to think about bothering you. Remember though: briefly you don't want them to think you are interested in them. Carry pepper spray, mace, or tear gas especially if you are running at night. (This pepper spray is perfect for runners.) Just make sure you know how to use them properly. If you are going for a long run wear a fuel/water belt, have someone meet you at certain stops along the way so you can refuel, plant water bottles along your course or run where there are water fountains. You may want to carry some cash with you. You never know when it might come in handy (especially when you are exploring a new city). If the humidity is above or around 90% skip your run even if its not that hot outside. Running in high humidity levels can simulate high intensity exercise and cause fatigue and dehydration earlier. It's always a good idea to run with some form of identification on you. This ID bracelet does the job! There have been many cases where an ID band has saved someone's life. If you are running on a new trail or running through a new city or town, take a map with you. Tie your shoe laces tight. Follow your instincts. They usually serve you well.